The first flavor I pick up is a light smoke and salt. There's an oily flavor and feel. Meanwhile, a bit of garlic is noticeable. The chewing brings on a bit more salt and garlic seasoning, with touches of sweet. For being marketed as, "Honey", it actually doesn't deliver much. It's only lightly, and most of that comes in through the chewing. There isn't really any honey flavor noticeable. Otherwise, the primary taste profile is a moderate saltiness with a garlic seasoning, and a faint bit of sweet. There's a light bit of natural meat flavor that comes in from the chewing. The black pepper is even more faint, but is there if you look for it. The meat consistency seems great. Most pieces are void of any fat and stringiness, while a few were lightly marbleized. Some pieces are tender while others require more work to chew through. Most of these pieces are oily to the touch and may cause you to wipe your fingers on your pants if you don't have a napkin handy. But it seems to have a great steak-like chewing texture. 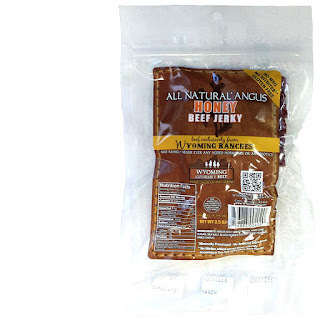 This Honey variety from Wyoming Gourmet Beef doesn't really deliver a recognizable honey flavor, nor is it sweet to any significant degree, but it does offer the excellent chewing texture of all natural Angus beef. 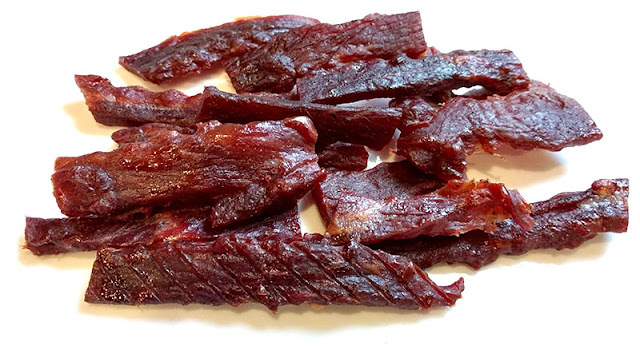 In fact, if you prefer lightly seasoned and marinated beef jerky, this is a great choice for its emphasis on cattle raised the way Mother Nature intended. 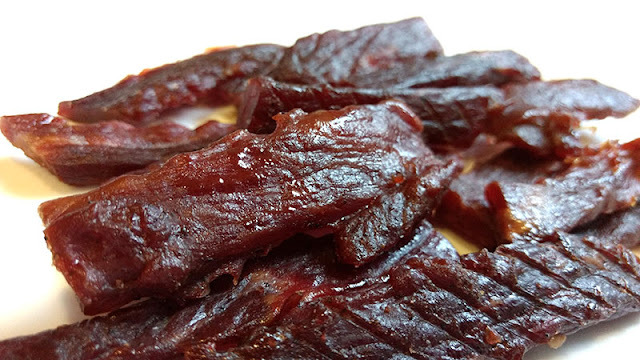 Overall, the seasoning is nothing special or original, just good old fashioned jerky made with honest-to-goodness Wyoming Angus.